Once you understand the economics of the oil and gas upstream industry, understanding the industry becomes easy. Oil and gas shale plays have transformed the North American oil and gas industry (see Exhibit 1, for a play index map). Now, such plays look increasingly set to transform the global oil and gas scene as more developments outside NA emerge with increasing activity in the Vaca Muerta in Argentina, China shale gas, UK shale gas, Saudi Arabian shale gas, etc. 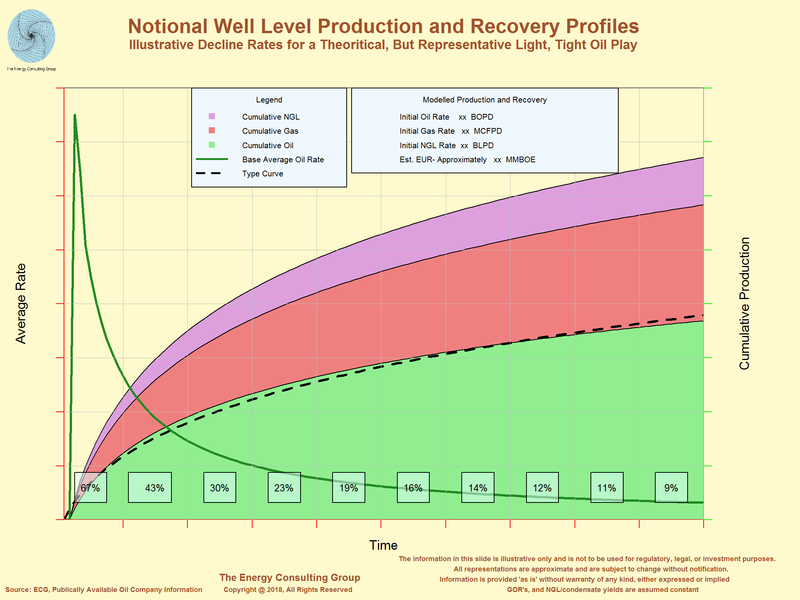 Note: all the production profiles and economics presented below come from our proprietary EVAL program (Economic Valuation Assessment Lens) . 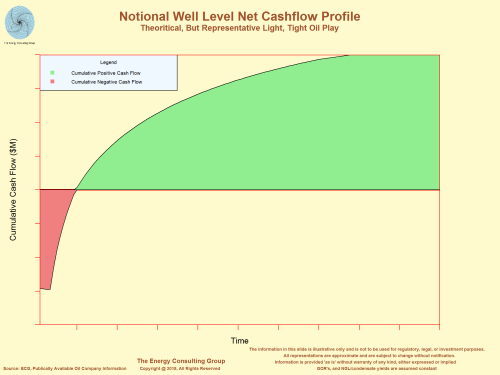 This is the economic analysis program we developed at the Energy Consulting Group (ECG). 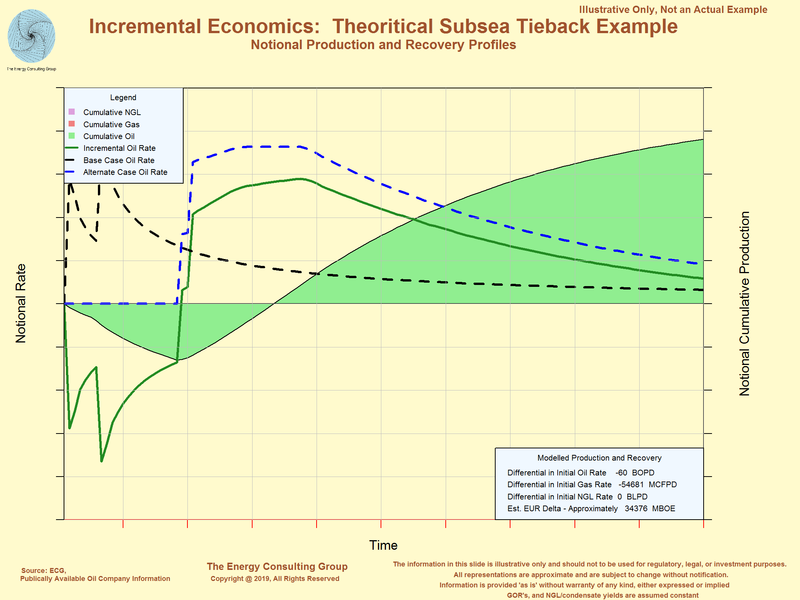 It is flexible, accuracte and easy-to-use, and, therefore, invaluable for understanding the economics of the oil and gas industry. Because of the nature of most of our work, it has been tuned specifically with non-conventional assets in mind. One of the ways we have done this is to integrate it with the R statistical program. 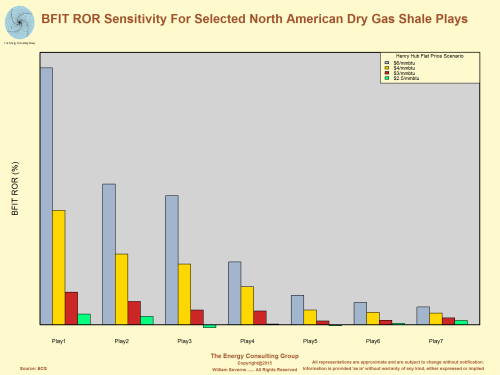 Some in the industry call or have called shale gas and/or light tight oil plays "statistical" plays. 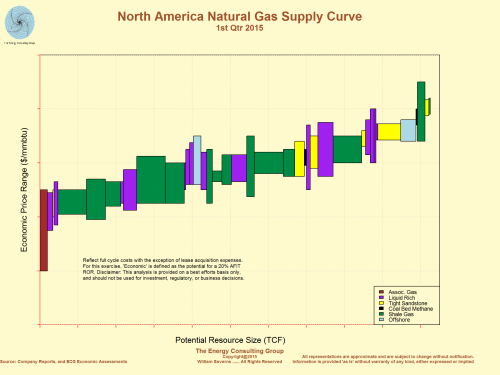 We don't disagree, which is why we have matched up standard industry approaches for production and economic modeling with the statistical, stochatic models of R.
We have intentionally left off axis labels and certain other information in many of the exhibits presented on this page. If you are interested in getting the fully annotated versions, please contact us at insight@energy-cg.com, and we will arrange either a conference call or SKYPE consultation. 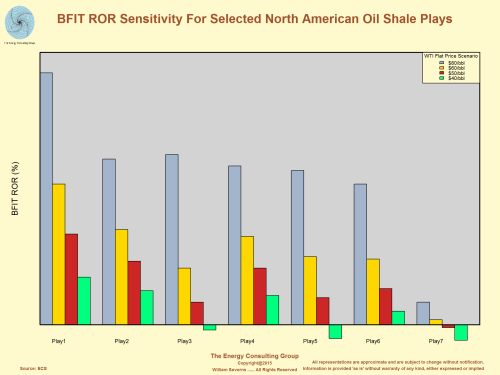 Where are the shale gas and light, tight oil plays under discussion? 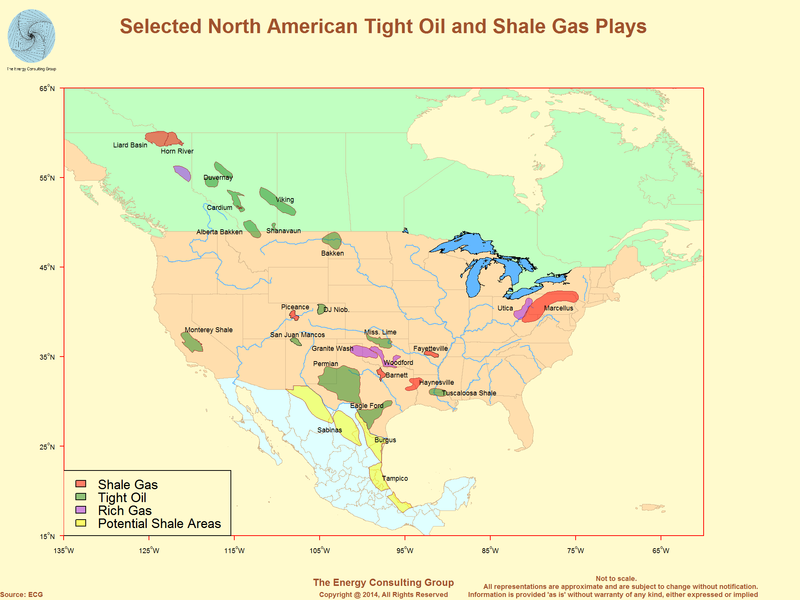 The following index map presents many of the more prominent North American plays. Prolific Initial Rates: The key attribute that makes the shale plays economically viable are "high" initial rates compared to the previous generation of nonconventional wells, such as those in tight gas plays. These rates can lead to enough production during the economically critical first four years of production, to make the business case for drilling shale gas and light, tight oil wells, though other factors such as oil and gas prices, well costs, etc. also factor into the economic results. And, the associated rates of return can be spectacular. 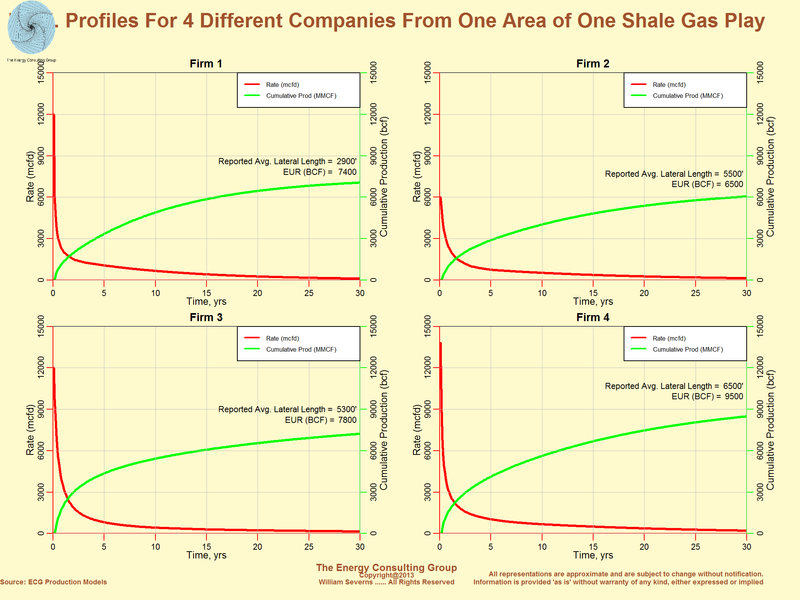 Our extensive work with the shales demonstrates that, depending on the specific circumstances, before tax ROR's can exceed 100%. Now, not every play, nor every well delivers such performance. 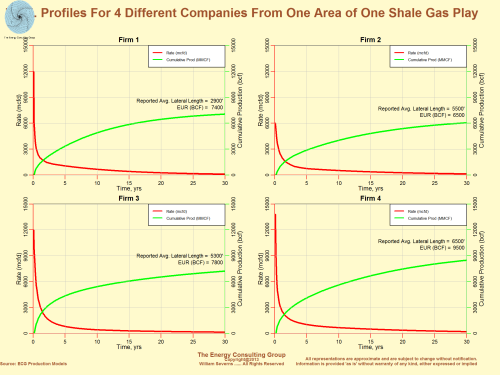 However, it happens with sufficient frequency for the shales to attract investors. So, while the initial decline rates can apporach 70%-80% over the first year of production (discussed next), high starting rates in successful wells can more than compensate. 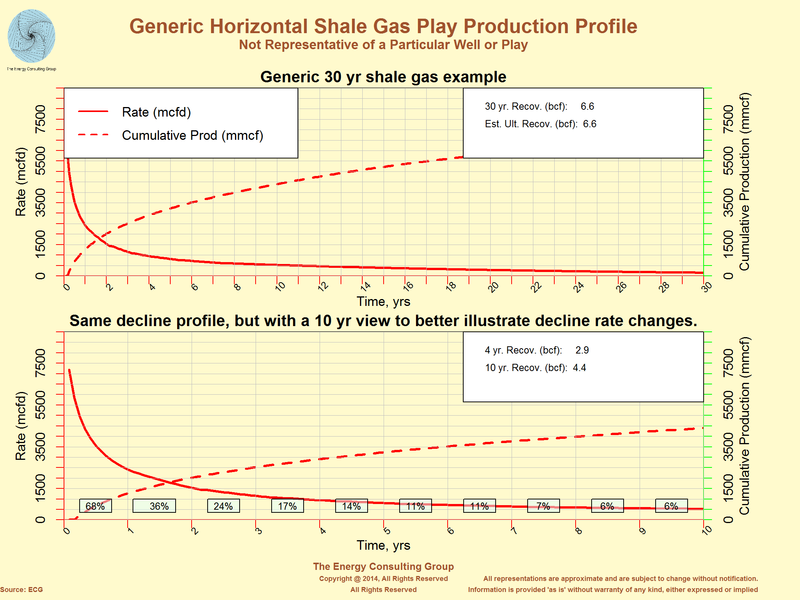 Decline profile: An obvious characteristic, and the one that receives considerable attention from non-industry observers, is the decline profile of a shale well (see Exhibit 2). 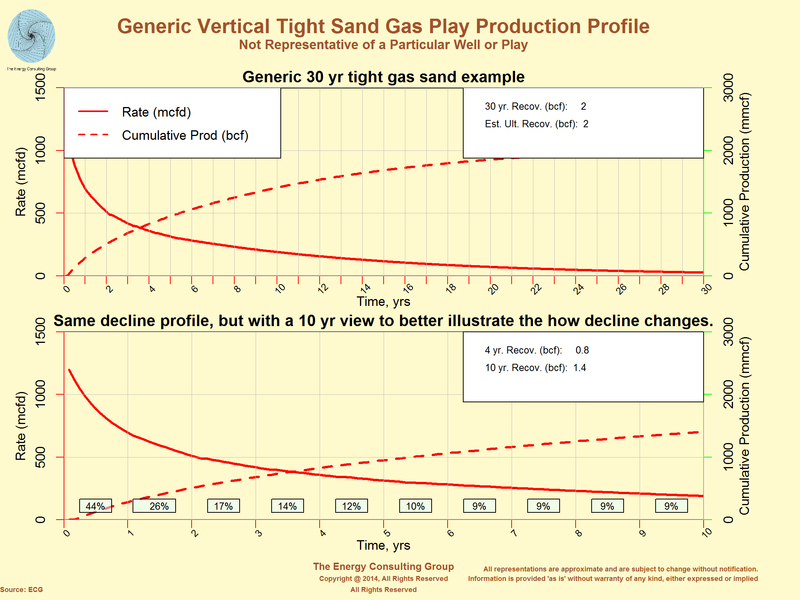 The defining feature is the relatively high initial decline rate in comparison with "conventional" sandstone and carbonate plays (see Exhibit 3). However, a subtle transformation can take place as a well ages. The high initial decline can transition into lower decline rates over the longer term. 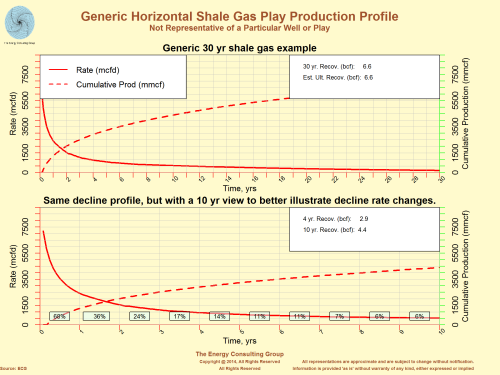 These lower, longer term declines mean that after a handful of years, many shale wells could well turn into long lived, low cost cash cows. High Well Costs: The two primary technologies behind the shale revolution are horizontal drilling and large, multi-stage frack treatments. 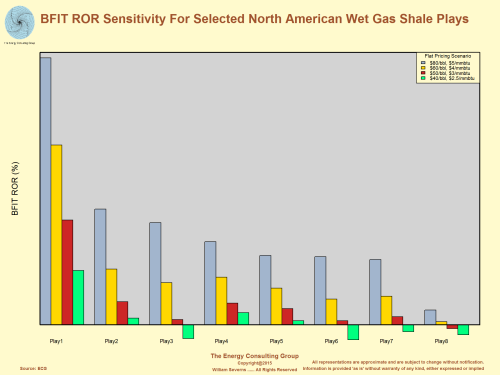 This page is not the place to discuss each of these in detail except to note that they can add considerable costs to a well, resulting in well costs that are greater than for either drilling a vertical well, or using "conventional" completions. In short, successfully applying these technologies costs about 3-5 times as much as a conventional well of similar depth in the same area. To illustrate this point, please look to the exhibit titled, "Drilling Cost Segmentation", which is a breakdown of cost categories for drilling and completing an average well in one of the major shale plays. 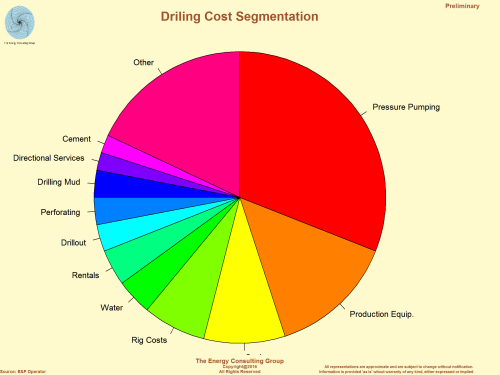 What is notable is the dominace of the fracing (pressure pumping) costs. 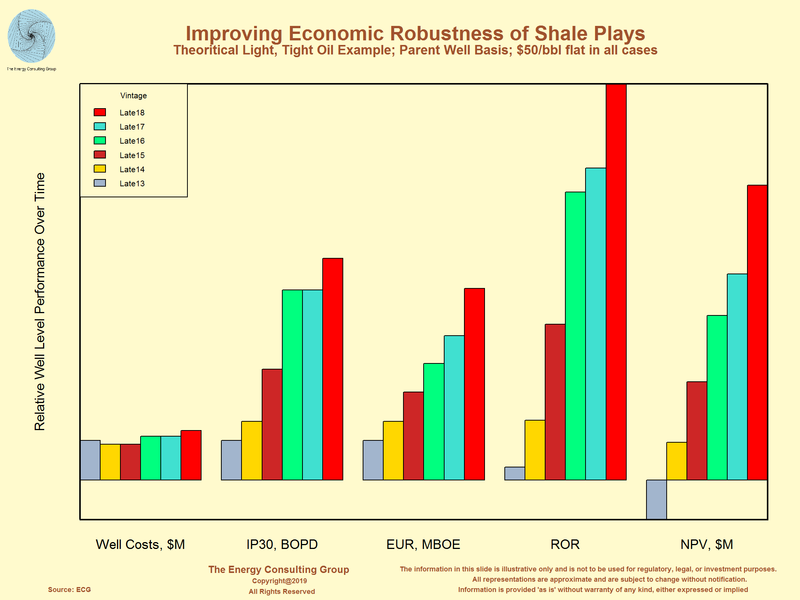 These three features (high rates, high declines and high costs) are key defining factors when considering well level economics in shale plays. Please note, however, these are not all inclusive. This discussion is intentionally leaving out references to leasing costs, operating/processing/transportation costs, overhead, facility costs, etc. We do this not because they are not important, but because they are typically not as central to defining well level economics. That said, there are exceptions, especially regarding processing/transportation fees. 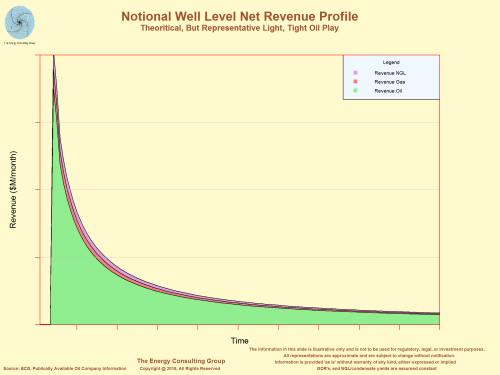 Another point to make is that the economics can vary considerably from play-to-play, or even within a play. The next three slides illustrate this point, and also show sensitivity of some of the more prominent plays to variations in oil and gas pricing. 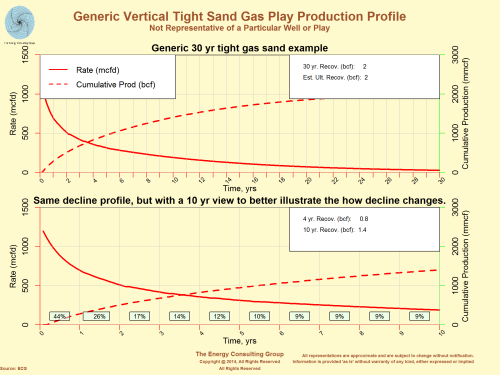 The final slide is a supply curve showing not only approximate volumes of supply at different price points, but also how the economics of different types of plays potentially compare to one another. The following are some examples illustrating the flexibility and usefulness of EVAL for quickly evaluating a variety of oil and gas investment opportunities, and doing so with confidence in the results.